Equiano was portrayed by the Senegalese singer and musician Youssou N’Dour in the 2006 film Amazing Grace. In African Snow, a play by Murray Watts, Equiano was played by Israel Oyelumade. Stone Publishing House published a children’s book entitled Equiano: The Slave with the Loud Voice. Poetry group: Sir Mask, have a dance poem entitled Yes You Know Equiano. Released independently Gigagroove the dance poem covers the life of Equiano. 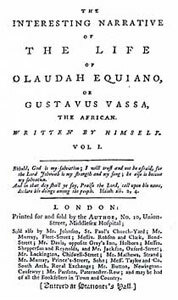 The Olaudah Equiano Story, a radio adaptation of Equiano’s autobiography. He was portrayed by Danny Sapani in the BBC series Garrow’s Law in 2010 as giving evidence in a trial of the captain of the Zong. The captain had died shortly after the incident and so his trial for fraud never took place. Equiano did not appear as a witness in either of actual cases. 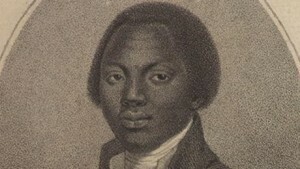 The Equiano Foundation aims to provide a valuable educational vehicle through which to resurrect, restore, and celebrate the meaningful contribution of Olaudah Equiano to Western, African, and African American culture particularly through his publication of The Interesting Narrative of the Life of Olaudah Equiano, Or Gustavus Vassa, and the African. His autobiography formed a new genre of slave narrative literature, spiritual autobiography, which consists of the main three-part structure of slavery, escape, and freedom that corresponds to the spiritual autobiography’s three parts that describe the life of sin, conversion, and spiritual rebirth. I was first interested in him when I viewed the PBS video Africans in America in Black Studies class. I became interested in his story of being kidnapped as a young boy and wanted to learn more about him and the experiences he had to undergo on a salve ship. What I learned from Equiano: I learned that no matter if Equiano really was of African origin or not, he was still important in that his story influenced British lawmakers to abolish the Slave Trade. It made me think of how one seemingly insignificant person could do so much to help change the institution of slavery just by writing a book and what more he could have done if he had lived longer. How what I learned will affect my actions: Equiano’s story inspired me to find out more about the Atlantic slave trade, thereby causing me to reflect on how things have changed and progressed in society since then to where African Americans are no longer enslaved, have the right to vote, etc. but how African Americans today still undergo prejudice and discrimination. This really made me angry and I want to not only help make sure that African Americans are no longer discriminated against, but people of every race and origin. I want to be active in civil rights demonstrations and read more about laws that are in congress that are waiting to be judged on that could affect minority societies. Painter, Nell Irvin. “Creating Black Americans: African american History and it’s Meanings, 1619 to the Present.” Oxford University Press, 2007. Pgs. 29-31.